Bus from Kuantan to Temerloh is the most convenient mode of transportation option because bus is frequent, fast and budget. With just short distance of about 120km, flight is not suitable as the transport. While lacking train service in east coastal Malaysia also results in locals and travellers relying on bus service to travel from Kuantan to Temerloh. Transnasional is the only bus operator operating bus from Kuantan to Temerloh. Transnasional is the local favourite because of their excellent service, frequent schedule, and punctuality. Besides that Transnasional is also the national bus operator in Malaysia. Bus service plying between Kuantan and Temerloh is frequent because they are the top up largest cities in Pahang State. The earliest departure goes in the morning 8:30am and the latest departure is in the evening 8:00pm. The average travel duration from Kuantan to Temerloh is about 2 hours, depending on the traffic conditions. For short-distance bus journey, washroom break will be given upon request from the bus driver during the journey. The bus fare for this route service is charged reasonably at RM 12.00 for adult and RM 9.00 for child. All the buses from Kuantan will pick up passengers at Kuantan Sentral Bus Terminal. Passengers can easily access to Kuantan Sentral Bus Terminal by taking intercity bus or taxi. When the bus arrives in Temerloh, the bus will drop off passengers at Terminal Utama Temerloh. BusOnlineTicket.com is the most reliable and secure online ticketing system in Malaysia and Singapore. With internet access, you can always book bus tickets online with various bus operators in Malaysia and Singapore. 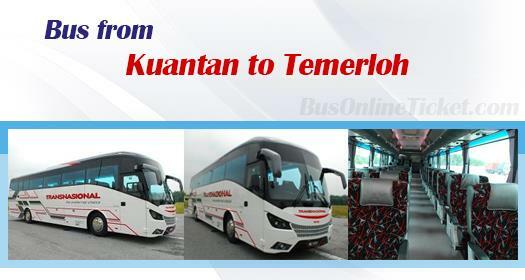 The greatest advantage to book bus ticket from Kuantan to Temerloh with BusOnlineTicket.com is that you will receive instant confirmation of booking upon payment is done. It's secure, simple, and easy!